AGUASCALIENTES, Mexico (AFP) — Belgian Victor Campenaerts set a new UCI world hour record for distance covered on a track on Tuesday, 55.089 kilometers, edging past the previous record set by British great Bradley Wiggins. The 27-year-old European time trial champion established the new record at the Aguascalientes velodrome in Mexico at an altitude of 1,800 meters. Wiggins, the 2012 Tour de France champion and Olympic gold medalist in the time trial, set the previous record of 54.526km in June 2015 riding at sea level in Manchester, England. 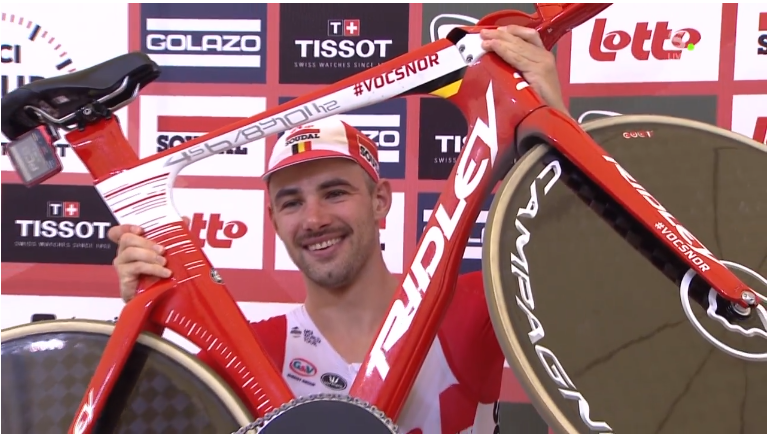 Careful pacing helped Campenaerts (Lotto-Soudal) beat the four-year-old world record. For the first half of the hour, he rode laps of the 250-meter velodrome at a consistent pace of 16.2-16.4 seconds. In the latter third of the effort, his lap times began to creep over 16.4 seconds but never slower than 16.6 seconds. “It was super hard, I was a bit optimistic in the first 30 minutes and then I said myself I had to slow down a bit the pace, but even with that, I think I was faster than Wiggins in all parts,” Campenaerts said. In the final six laps, he hammered out laps in under 16.2 seconds, with his final two under 16 seconds — among his fastest of the entire hour. To prepare for the high-altitude effort, Campenaerts had been sleeping in simulated conditions of 3,000 meters altitude during his two weeks in Mexico.